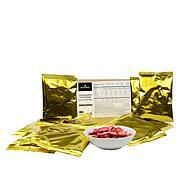 Help prepare yourself for the worst, even if it's just an unexpectedly rough hiking path. 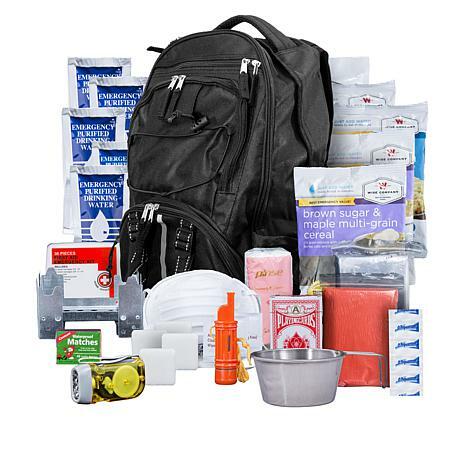 This kit is loaded with survival essentials like a first aid kit, water purification tablets, a portable stove and more. And it all fits in the backpack, so you can grab it and go. Whether you are preparing for the future or planning your next outdoor adventure, you can rest assured with this wise choice. Whey milk alternative contains milk. All food packets contain milk, soy and wheat. Creamy pasta and vegetable rotini also contains coconut. All items produced on equipment that also processes egg, shellfish, fish, tree nuts and peanuts. Ingredients: Pre-cooked Long Grain Rice, Maltodextrin, Dried Black Beans, White Corn Masa (Ground White Corn Masa Flour, Sorbic Acid, Carboxymethyl Cellulose, Calcium Propionate, Fumaric Acid, Guar Gum, Enzymes, Trace of Lime), Bleached Wheat Flour (Wheat Flour, Niacin, Reduced Iron, Thiamine, Mononitrate, Ribofavin, Enzyme, Folic Acid), Salt, Tomato Powder, Food Starch - Modifed, Black Bean Flour, Spices, Freeze-Dried Corn, Guar Gum, Paprika (color), Caramel Color, Natural Mesquite Smoke Flavoring, Citric Acid, Natural Flavors. Well appointed backpack for emergency situations. The water was expiring and I called customer service and brought that to their attention. Love the backpack. Roomy and good quality. 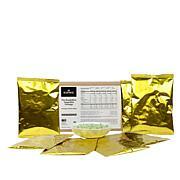 Contrast as expected provide a nice base for building a bug out bag. Plenty of room to customize contents, add extra clothes, etc. Super comfortable fit! I live in Oregon where we have a 37% chance of a magnitude 9 or greater earthquake occurring within the next 50 years off our coast. I decided to buy this kit for my car that way I am prepared both when I am at work and also when I am on the road. It has basic survival essentials for 5 days including food, water, first aid kit, flashlight, space blanket and waterproof matches. Buy it. It's good. 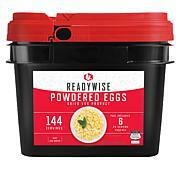 Whether for disaster preparedness, trips into the great outdoors or convenient, everyday use, these simple, dependable, affordable meals are ready to meet your needs. It’s testament to the company motto: Be Wise. Be Ready.